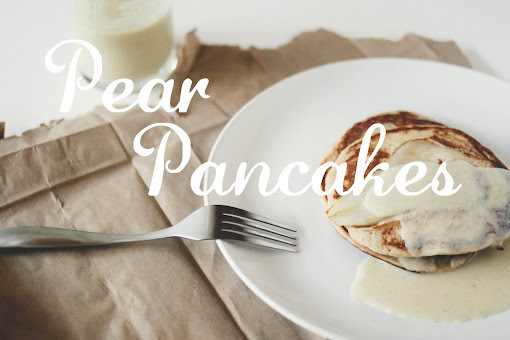 I've been having this obsession with pancakes. I just, well, love them. They're like a quick and easy dessert in my mind. I've made all kinds: the best, chai-spiced, matcha flavored, blueberry ricotta, mango coconut, even bacon greased hoecakes! They were all spectacular, but these, oh man, these... were so freaking delicious. These were inspired by the pear pancakes from The Kitchen, which I've personally never tried but my best friend rants to me about them all the time. But truly, they were inspired by the gorgeous pears I bought from the Farmer's Market. 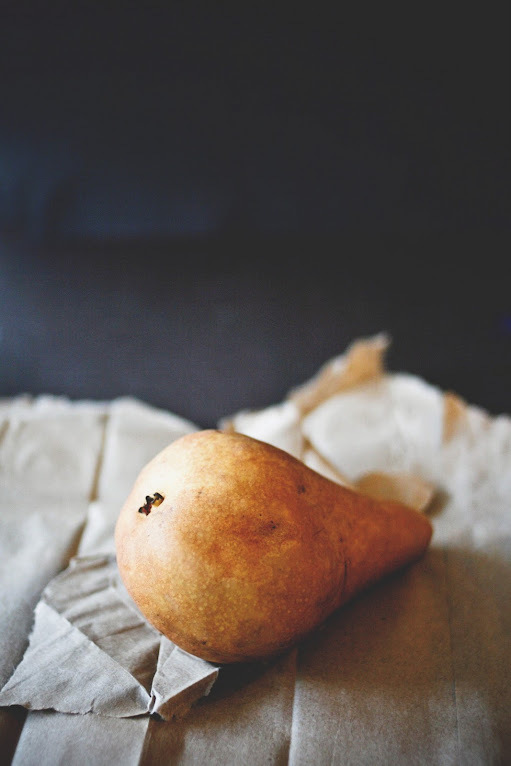 They were the most delicious pears I've had in a while: supple, buttery and so deliciously sweet. They cost a pretty penny but they were definitely worth it. 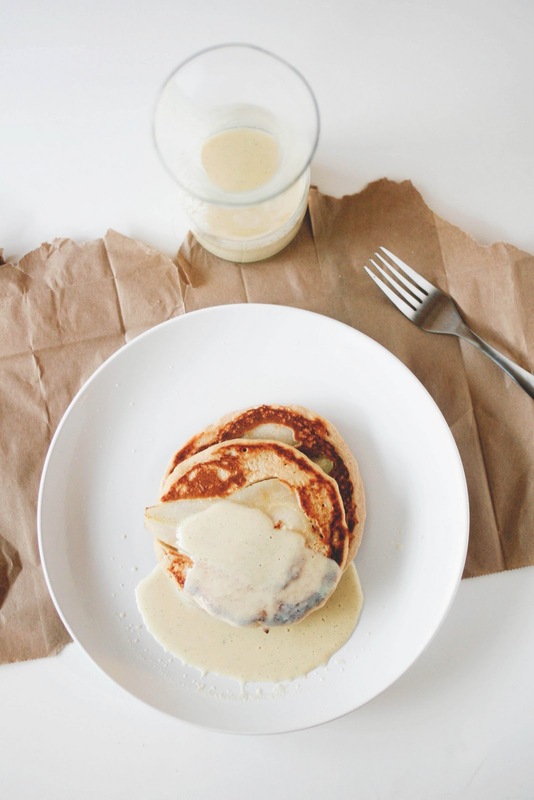 You might as well call these pancakes dessert since I served them alongside my favorite sauce ever: a vanilla-bean creme anglaise. Think: the best vanilla bean ice cream, melted and smothered on top of your pancakes. Yeah, it's awesome - your tastebuds and tummy will thank you. In a medium bowl, sift together the flour, sugar, baking powder, salt and spices. Whisk together the crème fraîche, milk, eggs and vanilla. Add the wet ingredients to the dry ones, mixing only until combined. Melt some butter in a large skillet over medium-low heat until it bubbles. Ladle the batter into the pan (about 1/4 cup per pancake). Arrange a slice of pear on top of the batter. Cook for 3 - 4 minutes over medium heat until bubbles appear on top and the underside is nicely browned. Flip the pancakes and then cook for another 1 - 2 minutes, until browned. Continue this process with the rest of the batter. Serve with the crème anglaise. yummmmmm... i love breakfast food. Dang, that is gorgeous. I love that you just plopped a whole slice of pear right in there. ooh-la-lah. these are amazing. thank you for posting these beautiful images and the fabulous recipe! 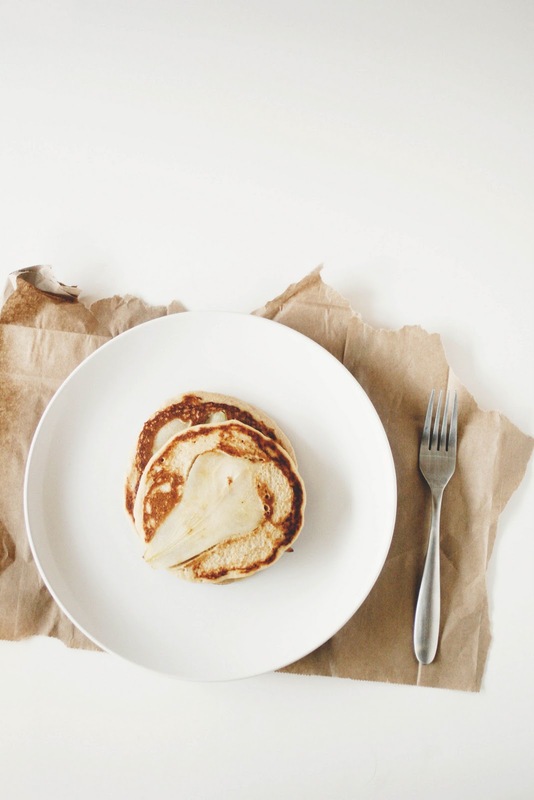 The pancakes look delicious - I'm a sucker for all things pear - and your photos are equally amazing. These look so delicious! I can't wait to make them :) your photos are awesome too! Love these pancakes! They look just perfect, delicious and fluffy! And the photos are simply beautiful! I would like to invite you to share this post (and other posts :-) ) on a new photo based recipe sharing site that launched only this Monday. The idea is simple: all recipe photographs are published within minutes of submission. And, of course, the images link back to the author's site.